A journey adventure for 11th-level characters. Auranorex, the greatest gold dragon in the world, is dead and his kin are looking for answers. To uncover the mystery of his demise, the heroes must travel to the one place forbidden to all mortals: the dragon graveyard. 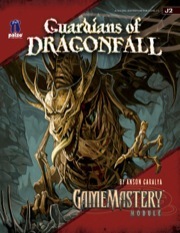 Guardians of Dragonfall is a mid-level adventure written by Anson Caralya that has the players investigating the untimely death of a dragon. Violating the dragon graveyard is a death sentence and the heroes must risk their very life if they are to uncover the secret behind Auranorex’s fate. Very colorful and imaginative...loved being immersed in this story! From a DMs standpoint I can say you would have some frustrated players if they didn't know they would find flying/levitating almost mandatory and some serious elemental resistance at their disposal of some sort. Some real gems of creatures, personalities, unique treasure and such, and the story makes it easy to add some info up front to make things flow better than just a stand around and scratch your head over that impossible to bash door, etc....DMs will get a chuckle over the ways dragons revel in their final moments of typically ego packed glory (in this case by blasting humanoids to bits in various ways) but it will all be lost on players unless you somehow have some avatar-ish guide or tome given to characters-deity voice over lending some flavor at points...you get the idea...and had a LOT of room to flesh out the main setting however you would like as far as additional areas, creatures...this is just a glimpse at this interesting aspect of dragon culture, and one I recommend! This adventure is the first of the Pathfinder and GameMastery adventures that has not met my fancy. The adventure was too linear and mundane and deserved to be either much higher level or have a less epic storyline. The free PDF is great, but in this case, it is of little value to me as I will not be spending time running this adventure. in a manner that I found completely flavorless. make things interesting at high APLs, why clamp it so low? and put into other contexts). It's worth your money just for that. Good but not epic is the most condensed review I can give of the module. While the module is a good read (I must confess I haven’t run it) it just lacked the epic feel I was expecting. The Dragonfall in the title is a dragon graveyard, but not just a dragon graveyard, THE dragon graveyard. Somehow I just didn’t get that epic feel from it. The Dragonfall just didn’t feel epic. Firstly the construct that guarded it just seemed to weak to me. They are supposed to have kept this legendary dragon graveyard safe for millennia against powerful adventurers, mages etc and they are only challenge rating 8 and 9? Also their look and concept as flying construct snakes really did nothing for me. The art for them did not help. I am aware that this is very subjected but as monsters they left me cold. The whole adventure lacked this feel of epic-ness. While the villains where cool, the various dragons in particular, I didn’t really believe that they could have infiltrated and overthrown the worlds only dragon graveyard. The locations in the module were awesome but I didn’t feel they were used well enough. The Paragon Hall has an amazing list of all the most powerful dragons that ever lived and you end up fighting an unrelated dragon. I also was want desperately wanting to know more about the graveyard rooms. I also had trouble believing that these rooms would be enough to contain all the dragon skeletons from each colour. It was little aspect like this that really brought down my enjoyment of the module. Having said the negative many of the encounters where individually great. And if I don’t use the entire module I will definitely lift some of the encounters from it. Impressive, Moreso for Pathfinder players. 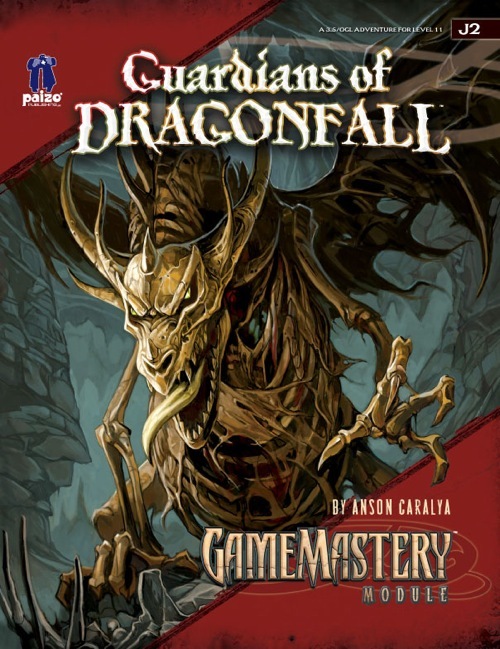 This is a pre-play review, since it'll be a while before my players at as far as Dragonfall. Nonetheless, I've read and assessed the module and have to give due praise. All the usual Paizo features are to be found, good production values, nice art and a solid layout for combat statistics and such. In addition, it has a fairly grand feel to it all, if perhaps not such a great incentive on its own to go on this 'suicide run' to Dragonfall itself, but I think by 11th level the DM can contrive good reasoning for it. The behind-the-scenes notes are appreciated, as is the link to Pathfinder #4. I feel that Galorian is shaping into a very nice setting and this product highlights that. While I can't account for the balance of encounters, they seem fair and well-designed. High-level magic and monsters feature as you'd expect however, so good DM management is a must. But honestly it's not something that should be an issue by 11th level. Overall I can't fault it. I'm reluctant to over-rate and praise products needlessly. But for the price, page-count and intent, GoDF fulfills all its goals very very nicely. Highly recommended. I have only just glanced through J2 PDF so am not really in a position to make a detailed comment about the module but I am a little disappointed with the concept of the product coming out under the J label. I read under a discussion about J1 that what was meant was not so much 'Journey' as a 'Destination' ie a dungeon far away from where the players start. But when paizo initially put out their labelling the ones that had me most interested were Urban, Event and Journey. Urban and Event have done the trick but I expected the Journey stuff to be more like a road trip. Like that great Dungeon adventure 'Racing the Snake' or maybe that one where the party have to heard a bunch of bugs into the underdark (name escapes me), something where the adventure is to do with travelling from point A to point B, you know a Journey. I know I am being a bit picky but I guess it was because this stuff inspired me. I thought awesome an adventure about a sailing trip from one great port to another, or a low level adventure about guarding a merchants caravan, perhaps an aerial journey helping protect some magical geese migrating north, escorting a wanted criminal to justice (a la the movies 'Midnight Run' or 'Gauntlet'), a trip to the moon, across the Andes by frog! (Ok now I am getting silly) etc etc. This is not a critiscism of J1 or J2, and is not a comment at all on the dungeons have been produced in this line - just a comment on the use of the descriptor Journey and the type of adventure I think it should cover. Is this style of adventure contemplated? I have to agree, though I'm a player in J1 and J2 and we haven't gotten to either yet so I'm not fully aware of what's inside. My impression of the J adventures was that of a long 'journey' such as escorting a caravan or a ship-cruise. I flipped through in the other day. The maps I saw make this look like a very cool locale. Anyone give it a good read through? I received my copy in the mail yesterday, and have given it a cursory read. It does look to be up to Paizo's usual high storytelling standards, and should make for an interesting adventure. I agree with the above posters regarding J = Destination rather than Journey, and Paizo staff have commented on this in other threads. For me, it means that I can run this adventure as a side-trek during a Pathfinder Adventure Path if the characters are falling below the required level to run the next adventure, teleport to this new location, without having to be too concerned regarding foreign locations, adventure continuity, conflicting adventure background, or unfamiliar NPCs into the current Adventure Path. One of the things that make GameMastery and Pathfinder work so well is the flavour and attention to detail. I initially considered incorporating D0 Hollow's Last Hope and D1 Crown of the Kobold King as preludes to Burnt Offerings in Sandpoint, but keeping Sandpoint's infamy for Goblins, and Falcon's Hollow reputation for Kobolds, gives these locations identity. Mixing them up would lessen the impact of both. So knowing an adventure contains a mechanism for transporting characters to/from their regular location, and can be run without interfering with local affairs, is useful to know. Though much longer in scope than a single adventure, the Pathfinder series already requires characters to journey over some distance to varied locations. However, I too would enjoy real Journey adventures such as those you described. Road-trip adventures are great if played as stand-alone. However, I would imagine GMs desire them to connect different adventures, a bridge for getting their characters from Adventure A to Adventure C.
To appeal to as wide an audience as possible, Road-trip adventures would have to be flexible regarding their departure and destination locations, as well as the terrain of the journey, or otherwise GMs may find them difficult to insert into their chosen adventure path. Departure towns and destination cities need to be easily swapped out with those the GM is using, or sidebars suggesting how to insert key NPCs and necessary plot elements into the locations you're using. Trek through a forest or across a desert; accompany a merchant caravan; embark on an ocean voyage; navigate a river barge; all good ideas, but there needs to be a forest/desert/route/ocean/river between your departure/destination points for them to work. Even if departure/journey/destinations were all suitable, the adventure would still have to be of an appropriate level for the players. Perhaps a "random encounters" product might better suit a Road-trip to cater to a wider range of play levels - though some locations/journeys would be more dangerous than others, so specific products could be roughly aimed at low, medium or high level play. Specific Road-trip adventures could work between already established and popular GameMastery/Pathfinder locations, eg providing a means for transporting characters between Magnimar and Korvosa, or further afield, such as Falcon's Hollow and Sandpoint. Pathfinder#2 contains an excellent Pathfinder Journal describing Eando Kline's encounters and journey up-river between Magnimar, Wartle and Whistledown, and could easily be converted into an adventure by a GM between Pathfinder#2 and #3. Optional stand-alone GameMastery Road-trips that provided more detail connecting locations that were only briefly described in Pathfinder might be a way of appealing to both GameMastery and Pathfinder audiences. I'm sure we'll see Road-trip products published in the future. I'm looking for a module to slot into my campaign for my 11th-level PCs. Where does this module take place? What kind of terrain is it? Can anyone who has played this or has it on their shelf give me some more information about the plot?